The Wellness Recovery Center was able to secure an in–kind donation of Sonoma Raceway Tickets for clients to enjoy. The tickets were obtained by the mother of a WRC client who has expressed her appreciation and support for all that the WRC does for her child. In total, the tickets have a retail value of $750.00. We are very thankful for this donation, as it has provided a brand new experience for many WRC clients. The event consisted of hot cars, hot sun, and lots of fun! Clients of our Solano County Wellness and Recovery Center (WRC) enjoyed San Francisco Giants baseball on Tuesday evening, July 18, 2017. As with previous outings to local events, this trip to the yard was made possible through a collaboration with the Community Access Tickets Service (CATS). WRC clients reveled in an exciting game between the Giants and the Cleveland Indians, complete with a 10th inning walk-off win for the home team. Clients and staff also enjoyed the relatively-warm San Francisco evening, ballpark food, and camaraderie. We remain greatly appreciative of the generous support of CATS, which allows clients to attend sporting and entertainment events at no cost and fosters positive community participation and integration. Caminar’s Wellness Recovery Center Solano Region is collaborating with Another Chapter. This organization "encourages a love for reading and is committed to providing access to books to children & adults in need." Their mission is to share the joy of reading and connect with the local community by providing free books. The WRC just received their 1st donation of books from Another Chapter and clients absolutely love the periodicals, books, and magazines provided. Natalie from Another Chapter will visit the Wellness Recovery Center every 30 to 60 days to enrich our clients with the gift of reading! It's May, which means it's Mental Health Month! 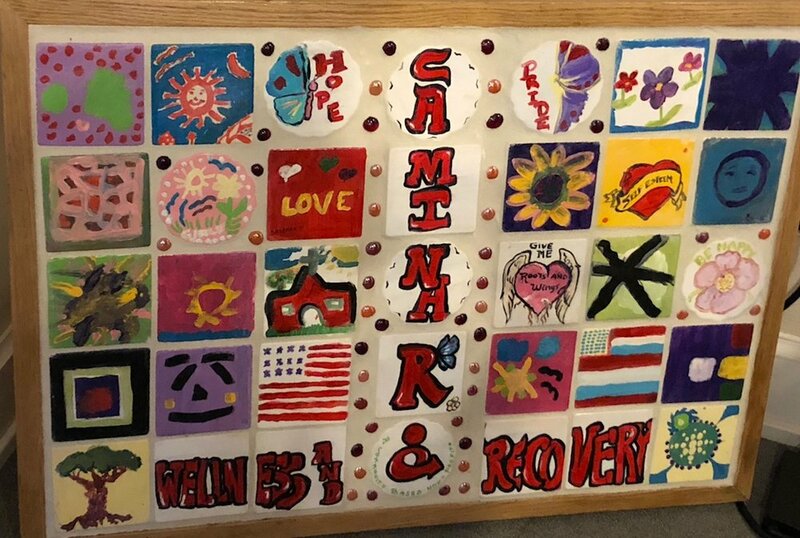 In order to celebrate and raise awareness around mental health issues, clients from Caminar's Wellness Recovery Center have decorated Vallejo City Hall with beautifully crafted digital and hand painted art. The Wellness Recovery Center is privileged and grateful for being able to take clients to an Oakland A’s vs. Anaheim Angels Baseball game on Wednesday, April 5th, 2017. This event was made possible through a collaboration with the CATS (Community Access Tickets) Program. The WRC clients had a lot of fun eating cotton candy and tuna fish sandwiches from their lunch that day at the WRC. They are looking forward to additional games and other entertainment events, which are provided at no cost to clients. The pictures below were taken during the game at the Oakland Coliseum. Clients from The Wellness Recovery Center were able to go to the Empress Theater and experience live music for free on February 22nd, 2017. The Empress Theatre is a historical landmark located in downtown Vallejo, California built in 1911. This visit is part of the ongoing efforts of the WRC to provide clients with experiences that they may not otherwise be able to receive due to economic circumstances. Please enjoy the images below, which were taken at the event. The Wellness Recovery Center was able to participate and go to the Academy of Arts Museum for FREE on Wednesday, January 18th, 2017, thanks to collaborating with C.A.T.S (Consumer Access Tickets), a non-profit organization. Ken Langill, Program Coordinator, is proud to share that he took 4 WRC clients to the Academy of Art Sciences Museum to see the Steinhardt Aquarium, Phillipines Coral Reef, African Exhibit and also the Planetarium. The Solano Region Christmas Party at the WRC was a blast! "Our friend and advocate of Caminar’s Wellness Recovery Center graced us with his visit to our Xmas party. 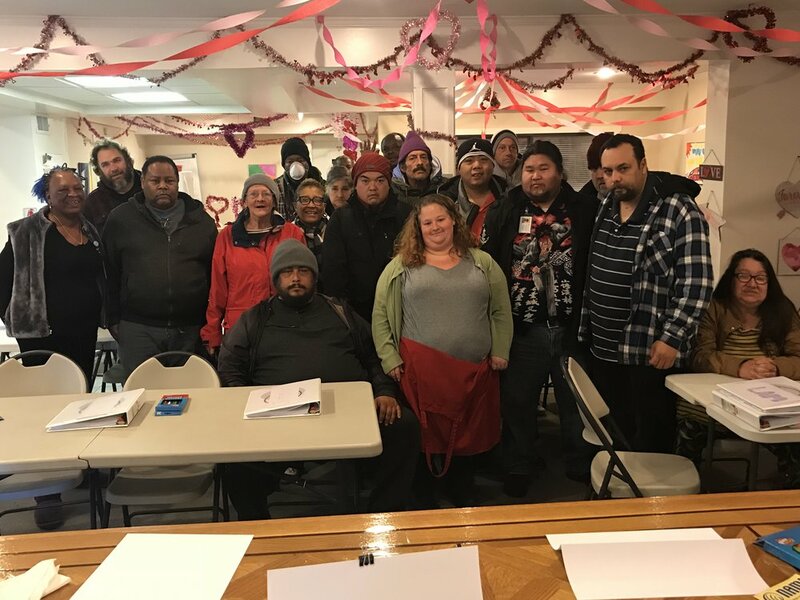 We had well over 100 plus people which comprised of WRC Staff / Clients / Case Managers and Mental Health Specialists from Solano County Mental Health as well as board and care and room and board operators." Kenneth Langill, Program Coordinator, WRC. Here are some photos from this very fun event. The Vallejo Executive Lions Club showed their support for mental health clients in Solano County by donating to our Wellness Recovery Center. The WRC is a peer run drop-in center for individuals with a known or suspected mental illness, located adjacent to Caminar’s medication clinic and case management services. 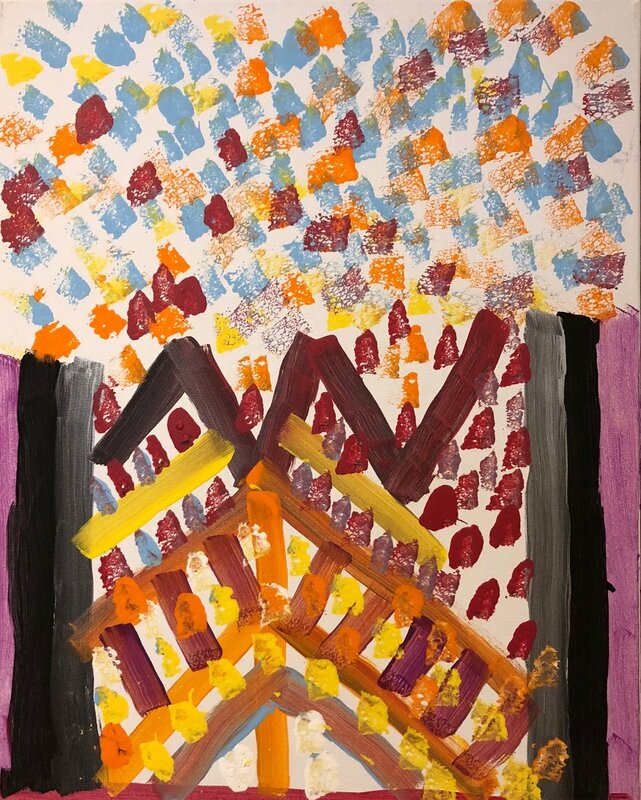 A wide range of educational and support groups are offered, including art groups (expressive, creative, storytelling art), employment preparedness groups by Jobs Plus, and library visits. "Lions Clubs International is the world's largest service club organization with more than 1.4 million members in approximately 46,000 clubs in more than 200 countries and geographical areas around the world. With the funds we make through our fundraisers, we offer assistance to local non-profits and needy individuals. We focus on eye care, recreational, and educational services for the elderly and youth." "I’m appreciative that the Lyons Club has donated $500.00 dollars to Caminar’s Wellness Recovery Center. I remember hosting the president (Gary Truelson) whom visited our center with another board member way back in May 2016. He was impressed with the Wellness Recovery Center. He then invited myself and Chris (Kughn, Solano Executive Director) to give a presentation to the Lyon’s Club Board Members on October 4, 2016 for their monthly luncheons at Zio Fraedos restaurant in Vallejo, CA. I’m happy for their contribution and thankful for their support!!" A new group of Caminar clients had the opportunity to experience live music at the Empress Theater. Read August's blog post (below) for more information about this fun event. The Empress Theatre, a beautiful 400 seat theatre with state-of-the-art sound system, huge stage, dance floor, and plush velvet seats, invited 3 Caminar clients to listen to live music free of charge. This event is part of a new monthly series that uses music as a form of therapy for adults with mental illness. "Being able to take the clients to these offsite events improves their quality of life and enables them to enjoy what they normally would not be able to participate in otherwise," says Kenneth G. Langill, Program Coordinator of the Wellness Recovery Center in Solano County. Langill was able to secure complimentary entry for 3-4 Caminar clients in the Wellness and Recovery program to experience live music at this wonderful venue once per month. We want to thank the Empress Theatre for their generosity and for supporting Caminar's mission to help people with disabilities live happy and enriched lives. For more information about the Empress Theatre, please visit their website: http://empresstheatre.org/. Photos of the last event shown here were taken by Empress Theatre staff photographer and Caminar advocate Gary Cullen. Caminar clients are looking forward to the next trip on September 21st. We want to thank the Empress Theatre for their generosity and for supporting Caminar's mission to help people with disabilities live happy and enriched lives. On Friday, April 15, the Caminar for Mental Health Wellness Recovery Center in Solano county was filled with the sound and joy of music as dozens of people attended the inaugural #Music4MentalHealth concert series. A near capacity crowd of 44 Wellness Recovery Center clients, staff and Full Service Partnership case managers attended the concert headlined by local jazz guitarist Leo Cavanagh, who donated his time and talent. Cavanagh has a 50-year history playing the guitar and his songs delighted the crowd. Langill said last Friday’s concert show is the first of many planned for the Wellness Recovery Center as part of the #Music4MentalHealth series. Those wanting to RSVP for future concerts can contact Kenneth Langill at KennethL@Caminar.org.